A visit to Theme park De Westlandse Druif is an eminently worthwhile experience. Visitors are shown around by our volunteers, who will be delighted to explain this special cultivation method that was the origin of the success of Westland horticulture. You’ll hear interesting facts about grape cultivation, the tasks involved and some amusing anecdotes. 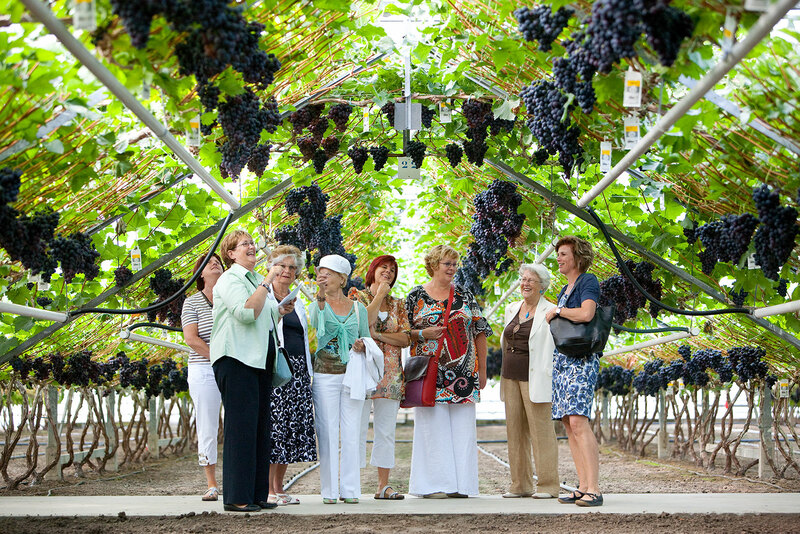 Before or after the guided tours of the nursery, you can watch a specially produced 20-minute film and take a look around our small museum, which will take you back to the heyday of grape cultivation in the Westland region. Finally, there is always an opportunity to browse a variety of grape-related items in our shop. NB: You must register in advance for guided tours, so we can ensure that one or more tour guides are available at the appointed date and time. Access to the nursery is only permitted as part of a guided tour. To book a guided tour or request information, please fill in our form. From July 1 to the end of December, all visitors receive a dish of grapes to sample. Along with the guided tours for groups, there are also guided tours for drop-in visitors at set times. In addition on Saturday / Sunday: from 11:00 to 14:00, a tour guide is available for short guided tours, possibly including the film and grape sampling. Special arrangements can be made for groups upon request.